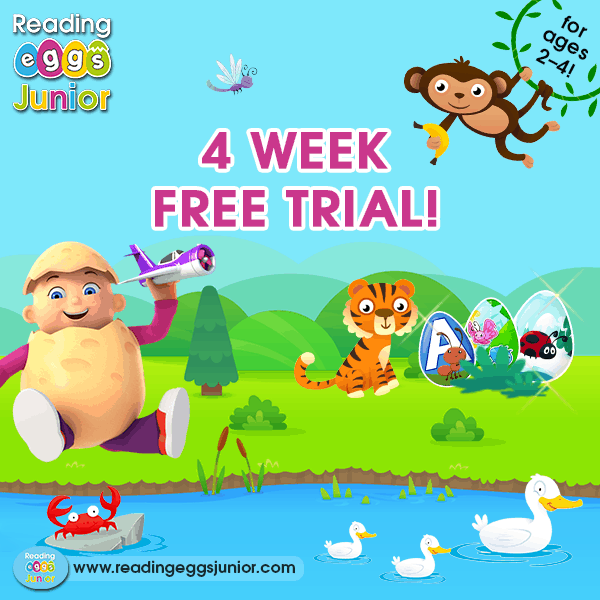 Sponsored post reviewing Reading Eggs – with a four week trial code for readers. Wondering about this popular literacy app? Here’s your chance to try it out. I very rarely write about apps and computer programs on this site, but I have several friends whose kids use and love Reading Eggs. It’s also one of the apps funded by my kids’ charter school (anyone in the school can use it for free). So, when I was offered the chance to write up a sponsored review, I decided to give it a go. 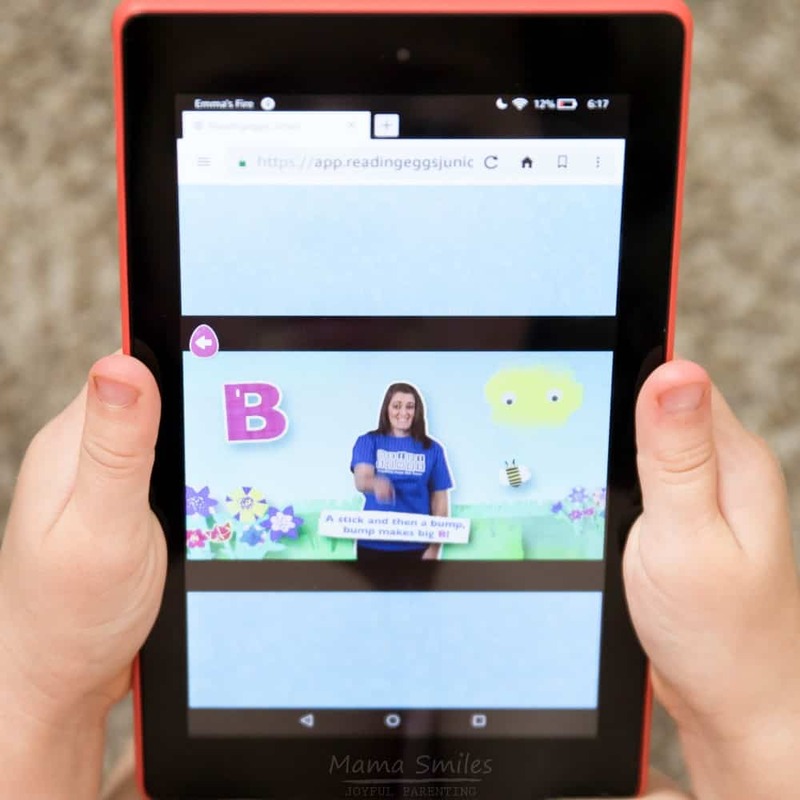 We were asked to focus on the new Reading Eggs Junior app for this review. It’s designed for kids aged 2-4 years old, and uses a lot of songs and music to introduce kids to letters. My youngest daughter Anna is a fan! I liked the app’s use of music, and that children are introduced to letters as shapes (see text in the photo below). This helps kids as they learn to write letters the same way this letter learning manipulative helps. The app comes with some great free letter printables that extend learning offline. I’m a huge believer in kids learning to read when they are ready, rather than being pushed. This program introduces letters playfully, but I didn’t feel like it was pushing kids to do things they weren’t ready to do. Anna is vaguely interested in words and letters, and she finds the program engaging. My oldest daughter Emma LOVED letters when she was young; she would have adored Reading Eggs. Buying access to Reading Eggs Junior gives kids access to all of the Reading Eggs programs. So, as your child develops skills, they can move through the programs without requiring new subscription purchases. This also includes the reading eggs math apps. You do have to buy separate subscriptions for siblings. 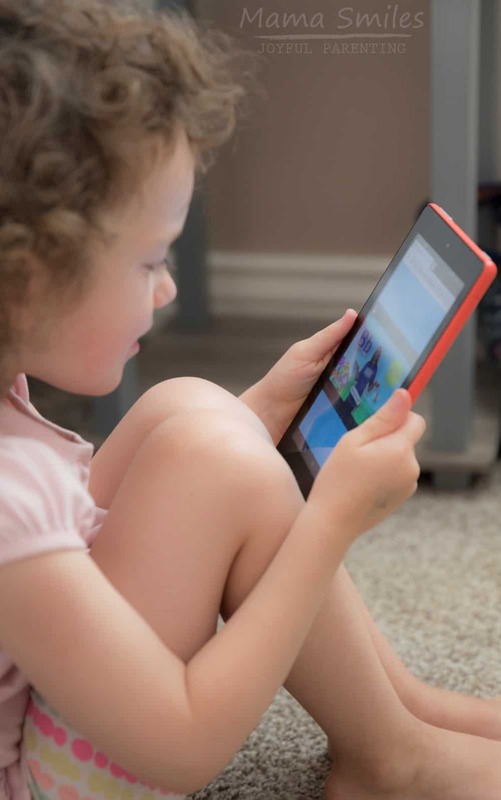 I still believe that young children learn best through hands-on play, but there are times (flights, doctor’s office visits, packing up a house) when screen time is very helpful! This is a an app that keeps kids thinking as they play. I do hope they also bring in some early math learning activities for the younger set! Do you want to give Reading Eggs Junior a try? Visit https://readingeggsjunior.com/smiles/ to sign up! Have you tried Reading Eggs? What did you think? This post is brought to you by Reading Eggs and The Motherhood. All opinions are my own. I’ve thought about looking into this for my daughter. I like how playful the apps are. Looks really interesting and fun for kids. It looks like a cute phonics program! Ahhhh, this is the junior one. I knew several people who used it to teach their kids to read.